Aren’t there times in your office when you feel powerless to prevent injustice? Does that mean you should even fail to protest against the injustice? I believe no injustice should go un-punished, un-protested, un-reprimanded; and if you haven’t assembled at a place to protest injustice, think about doing so at once. Don’t fail, again. Realise that if you do not strike at those perpetrating injustice, your security and safety shall be irretrievable. 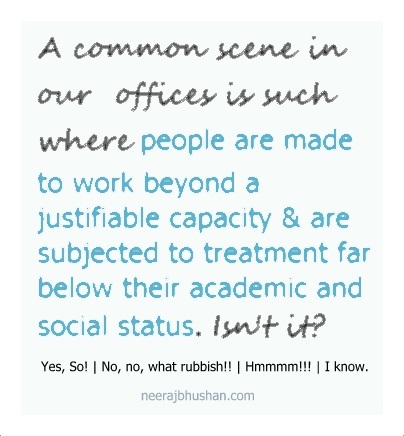 A common scene in modern day’s offices is such where people are made to work beyond a justifiable capacity and are subjected to treatment far below their academic and social status. Isn’t it? Plus, if you are a contract employee you are too vulnerable to unprecedented pressures, added to the lack of security that is ingrained in your service condition. Yes. Yes. Yes. What else: Prepare your colleagues and office for constituting a Works Committee in your establishment. It will protect your interest by controlling the observance of labour legislations at your workplace. Such a committee will also play a major role in settling labour disputes, if any, in your company. What is a Works Committee: It consists of representatives of employer and workmen in such manner that the number of representatives of workmen on the Committee is not less than the number of representatives of the employer. The total number of members does not exceed twenty. This Committee promotes measures for securing and preserving amity and good relations between the employer and workmen and, to that end, comments upon matters of their common interest or concern and endeavour to compose any material difference of opinion in respect of such matters. What if my employer refuses to cooperate: You just have to write a simple application to the concerned labour authority to pass an order directing your employer to constitute a Works Committee in your establishment. Qualification of candidates for election: Any workman with a service of not less than one year may be a candidate for election as a representative of the workmen on the Committee. Qualification for voters: All workmen who have put in not less than 6 months’ continuous service shall be entitled to vote in the election. Officers of Committee: The Committee shall have among its office-bearers a Chairman, a Vice Chairman, a Secretary and a Joint-Secretary. The Secretary and the Joint-Secretary shall be elected every year while Chairman, Vice Chairman and other members of the Committee shall be elected for two years. While Chairman shall be from amongst the management, the Vice Chairman shall be from amongst you. 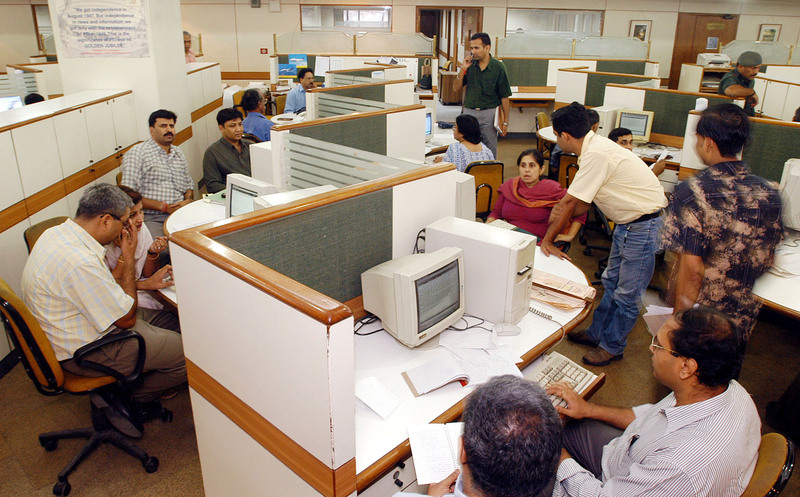 The posts of Secretary and Joint-Secretary shall be swapped between the management and the workmen every alternate year. But my office is too small: In that case share the idea of Works Committee with your friends and associates whom you feel need to be made aware. Remember, a Works Committee is an important phase of your growth. You may be having the people doing trade unions or the unions trading people in your company; but Works Committee is a totally different thing. Its time you spread your wings; welcome the future with open arms and you may find that some problems you had thought insurmountable have finally given way. Defeat the fear and panic at your workplace. Stand up. Open your mouth. I have been surfing online more than three hours nowadays, but I by no means found any attention-grabbing article like yours. It’s beautiful value sufficient for me. In my opinion, if all webmasters and bloggers made just right content as you probably did, the web will probably be much more helpful than ever before.